Building Operations, the operator of the Vancouver campus of the University of British Columbia (UBC), is dedicated to maintaining and operating our campus spaces to ensure UBC remains at the forefront of improving our world. Our work includes maintaining and operating our lands, buildings, and fleet as sustainably as possible for the lowest total cost of ownership. For Building Operations, keeping costs low involves balancing between proactive maintenance of campus assets and making strategic capital improvements. Among some of the many daily functions members of our team perform, we keep spaces lit, the air temperature comfortable, waste sorted and recycled, and our campus clean. We have a saying in Building Operations: “UBC is not in the business of buildings, it’s in the business of ground-breaking research and exceptional student outcomes.” We know our job is to be the silent heroes who enable UBC’s students and faculty to reach our institutional goals. Together, this dedicated group works to help other members of the UBC community achieve greatness on campus — whether that involves enabling the spaces for the Nobel Prize-winning work of the Michael Smith Labs, or providing a welcoming student study space that leads to top marks and future career success. We are dedicated to proactively creating the best possible environment for learning and research in the most cost-effective way. 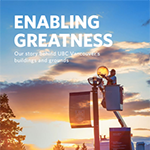 Read our book about how we work to enable greatness [PDF] across the UBC Vancouver Campus or borrow a print version from the UBC Library for your research. Key contacts to get Building Operations working for you as well as direct connections to the department’s leadership. 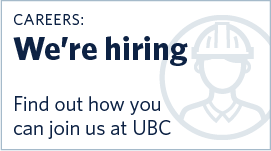 A brief introduction to the key people leading Building Operations for UBC. 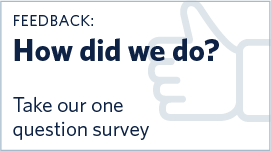 Get to know what's happening in Building Operations that affects users across the Vancouver campus. Wrapped in 800 hectares of dense forest known as Pacific Spirit Regional Park, our campus proper consists of more than 400 hectares of public realm containing 838,000 square metres of academic building space, and another 760,000 square metres of ancillary space such as student housing and athletic facilities.